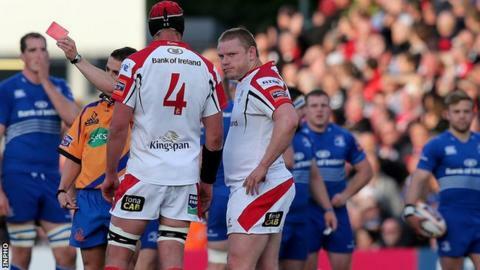 Prop Tom Court will miss Ulster's Pro12 semi-final after getting a two-week ban for his red card against Leinster. The Australian-born lock was sent-off for a spear tackle on Leinster forward Devin Toner during the first half of Friday's Pro12 match at Ravenhill. Court, 33, is moving to London Irish for next season so, if Ulster do not reach the Pro12 final, he will have played his last match for the province. Ulster will know their opponents after Saturday's final round of fixtures. Court, who attended a disciplinary hearing in Wales on Thursday, is suspended until midnight on Sunday, 18 May and has the right of appeal. The committee decided the offence was at the low end of the International Rugby Board's scale of sanctions for dangerous lifting tackles. The player's acceptance of the red card and his previous excellent disciplinary record were taken into account. Court is suspended until midnight on Sunday 18 May and has the right of appeal.